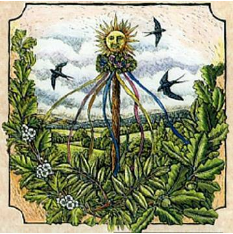 Beltane is a fertility festival that celebrates the return of spring, the sun’s warmth and nature’s abundance. It is a cross-quarter festival, celebrated approximately halfway between vernal (spring) equinox (Ostara) and the summer solstice (Litha). Literally, Beltane is thought to mean ‘fire of Bel’ or ‘bright fire’, associated with the Celtic sun god Bel, the bright and shining one. 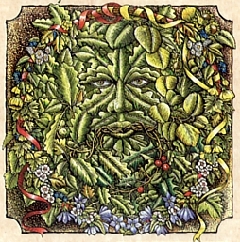 It is the Gaelic name for the month of May, also known as Beltaine/Beltine in Old Irish, Bealtaine in Modern Irish, and Bealltainn in Scottish Gaelic. Beltane incorporates many traditions, including the Gaelic practice of using bonfires to ensure protection from harm. 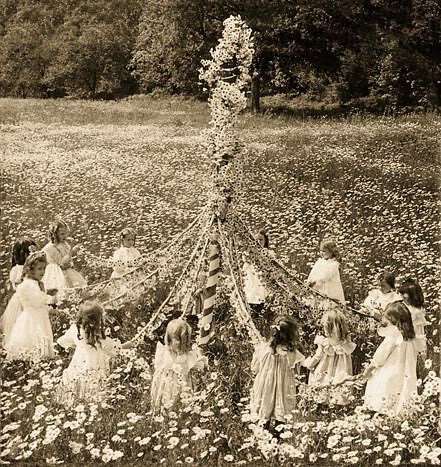 It closely follows the Germanic ‘May Day’ festivities, such as dancing around the Maypole to celebrate the earth’s growing fertility. In northern Europe, this day was called the feast of Walpurga, or ‘Walpurgisnacht’ (Walpurgis Night). In the Christian calendar, it was celebrated as ‘Roodmas’, or the Feast of the Cross. Beltane is the last of the three spring fertility festivals, the others being Imbolc and Ostara. In many Neopagan traditions, Beltane and Samhain are treated as the most important dates on the Wheel of the Year. They divide the year into its two primary seasons, the dark season of winter, and the light season of summer. On Samhain, the Wild Hunt is set loose to bring winter into the world, while May Day (specifically Walpurgis Night) is celebrated as the last night that the Wild Hunt of winter rides free. In Wicca, Beltane marks the emergence of the young God into manhood (known as the Stag King at this time). Stirred by energies in nature, he marries the Goddess (the May Queen) and she becomes pregnant. Beltane is associated with lust and passion! It is the traditional time for marriages and handfastings. Young unmarried adults would stay overnight in the woods ‘A-Maying’, while those who were married were given permission to remove their wedding rings and enjoy lusty freedom for the night. Often bonfires were jumped to encourage luck and fertility. Groups danced with ribbons or greenery around Maypoles, a phallic symbol of fertility and the union of the Goddess and the God to create life. Morris Dancing and images of the Green Man were also common. It is a time of planting, flowers, birds, bees and honey. At this time, it is thought that the veil between the worlds are at its thinnest (as with Samhain), therefore faeries are thought to return from their winter hiatus. As life springs forth from the fertile earth, this is a good time for all celebrations of fertility, new ideas, abundance and prosperity.